We are on the verge of a technological revolution in the way that we provide our indoor crops with the light they need. Suppliers are promising more efficient ways of using electricity, and new colored bulbs and led lights are taking the market by storm. The question is whether these promises are realistic and whether growers have the skills to benefit from them. In order to understand the way these light systems work, it is necessary to first explain what light is and how it affects plant life. Light is a form of radiation and as such can be divided into different wavelength categories: visible light, invisible radiation, near infra-red and infra-red. When light reaches a plant’s leaves, it is absorbed by cells containing chlorophyll. 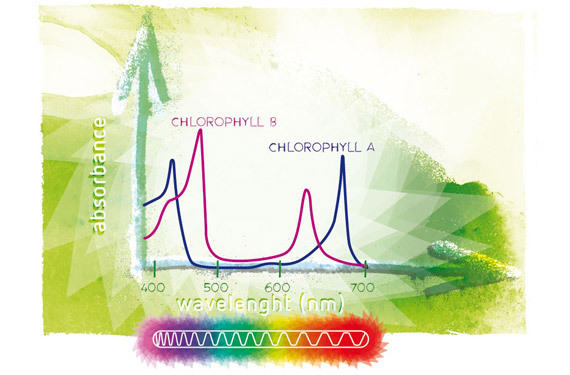 The two most important forms of chlorophyll, chlorophyll a and b, are most sensitive to blue and red light (see figure 1). Figure 1: The two most important forms of chlorophyll are most sensitive to blue and red light. Chlorophyll is critical in photosynthesis, which which allows plants to obtain energy from light. Theoretically these two colors of light alone would be enough to allow the plant to photosynthesize, but in reality every wavelength in the spectrum has its own function in the plant. Usually green and sometimes yellow light are partly reflected back, which is why most plants appear green to the human eye. The way in which the plant grows is not only determined by its genes, but also depends on wavelengths of light it is exposed to, including both visible and invisible light. UV-a light (315-380 nanometer) and UV-b light (280- 315 nm) have a positive effect on the growth of new branches and further have a similar effect on plants as blue light, although there are some differences. Too much UV-c (<280 nm) can damage a plant. Far-red light (700-800 nm) penetrates more deeply into the crop than other wavelengths, resulting in a plant, or parts of a plant, to grow and stretch towards the light source. Many flowering plants use a photo-receptor protein to sense seasonal changes in night length, or photo-period, which they take as signals to flower. These plants are classified as long-day plants or short-day plants, though the actual regulatory mechanism is governed by hours of darkness, not the length of the day. A long-day plant requires less than a certain number of hours of darkness in each 24-hour period to induce flowering; these plants typically flower during late spring or early summer. Short-day plants flower when the night period is longer than a critical length. They require a consolidated period of darkness for floral development to begin, but the specific length of the dark period required differs among species and even varieties of a species. Day-neutral plants flower regardless of the night length. Now that we have a better understanding what light is and how it effects the growth and flowering of plants, we can look at some of the new lighting technologies that have emerged in recent years. 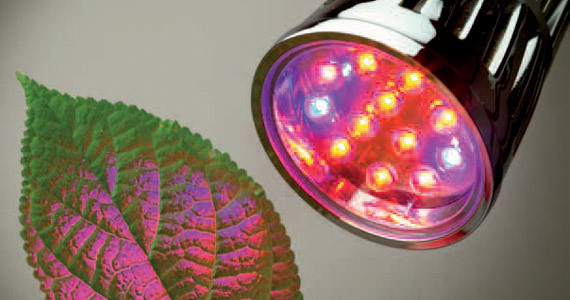 The most common type of photosynthetic lighting in horticulture today is High-intensity Discharge (HID) lamps. These contain a mixture of gases and metals enclosed within a glass tube. As electricity passes between the electrodes at the ends of the tube, the gas-metal mixture heats up and emits light. HID lamps can be either high pressure sodium (yellow light) or metal halide (white light). Sometimes a combination of both types of bulbs is installed to give a more uniform spectrum, while reflectors are used to direct the light toward the plants (See figure 2). Until recently, fluorescent grow lights (figure 3) have had a low output and have been too big and bulky to be of much use as a grow light for anything more than starting seedlings. 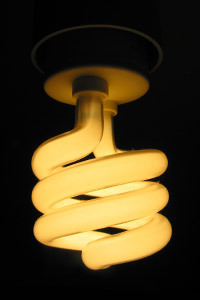 This has changed with the appearance of new compact fluorescent or CFL and T5 full spectrum fluorescent lights. These improved light bulbs are growing in popularity for both propagation and plant growth, as they are energy efficient and extremely effective, especially when used in numbers. While not quite as efficient as HID lights, fluorescents have better color rendering properties and produce much less heat when compared to HID lights. This allows them to be placed closer to plants greatly increasing their effectiveness. The application of light-emitting diodes (LEDs, see figure 4) as potential source for assimilation lighting in plant production systems potentially opens up a range of new possibilities. LEDs produce light in a very narrow wavelength range and do not directly emit heat radiation. The heat which is produced by LEDs due to their limited energy conversion efficiency can be drawn away via convective cooling. 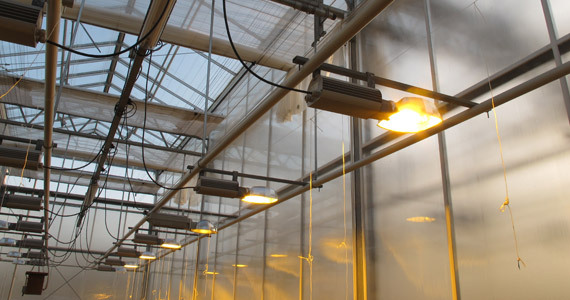 As a result, LEDs can be applied at relative dark places close to the crop, in order to increase leaf photosynthesis at locations where assimilation light normally doesn’t penetrate. In theory this type of inter crop lighting could significantly increase crop photosynthesis. At present most commercially available LEDs only emit red and blue light. Even though these are the wavelengths that plants use for their photosynthesis, they are only to be used in conjunction with other forms of lighting, as supplementary lighting or directable lighting. Although new LED systems cover a much wider spectrum, these are mostly still in the experimental stage. Plasma lamps produce a light spectrum similar to that of the sun and are therefore sometimes referred to as artificial sunlight. Plasma lamps use a small amount of sulfur which is excited by a magnetron, causing light emitting plasma to emerge. Under laboratory circumstances, when compared to plants grown under fluorescent tubes and high pressure sodium lamps, plants grown under artificial sunlight are characterized by longer petioles, a greater leaf unfolding rate and a lower investment in leaf mass relative to leaf area. This means plants grow bigger and accumulate more dry matter, even though the photosynthesis per leaf area is not greater. The large differences in plant response to the artificial sunlight spectrum compared with the widely used protected cultivation light sources highlights the importance of a more natural spectrum, if the aim is to produce plants representative of field conditions.